The US Men’s Sevens team has established itself as a force over the last four years on the World Rugby Sevens Series. Following a 13th place finish in 2013/14’s final standings, they have finished sixth three times and one in fifth in the seasons which followed, winning their first two tournament in their history in that time. One man at the forefront of that success is captain and linchpin Madison Hughes who debuted in that 13/14 edition and has since gone on to establish himself as the team’s all-time record points scorer. Born in Surrey to an English Father and an American Mother, Madison attended Wellington College in Berkshire before making the hop across the Atlantic to enrol at Dartmouth College in New Hampshire. 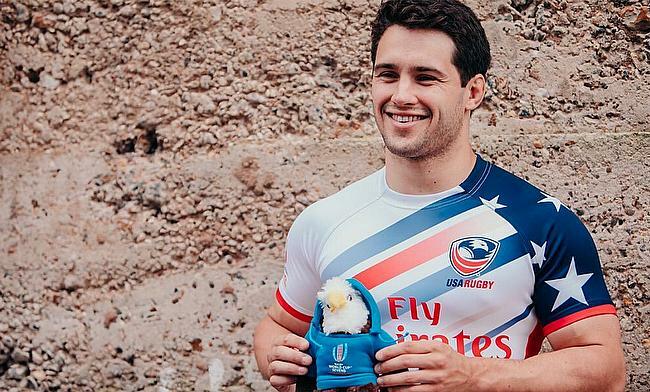 After tasting both the XV-a-side and 7s format at the game during his college days, Hughes went on to be part of the US team which competed at the 2016 Rio Olympics, as well as this year’s Rugby World Cup Sevens in San Francisco. As well as leading the US 7s team to their first ever tournament win on the London leg in 2015, Madison picked up three senior 15 caps at fullback against Tonga, Romania and Canada between 2016 & 2017. Ahead of this week’s opening round in the 2018/19 World Sevens Series in Dubai, Hughes took some time out to discuss all things US Rugby and how his career has unfolded. How are the team feeling leading up to the series? “We’re excited to go to Dubai, it’s the first one of the season and it’s been a while since we were able to play so it should be good and we’re looking forward to it. This @worldrugby7s season, Head Coach @mikefriday09 and the Men's Eagles Sevens aren't just chasing the shiny things. The end of July was the last time you guys played in an official fixture with the World Cup, so what have you been up to in that offseason? “We had about a month off that carried us through to the end of August, then the beginning of September we were back into preseason. We’ve just been building back up, getting everything in system, trying to work on some new things, because you know that every other team is doing the same thing so if you’re not getting better, you’re gonna move backwards. Have you set team goals and targets for the coming season? “I think when we come down to it, we’ll be trying to take each tournament as it comes and trying to do as well as we can. We’ve shown over the last couple of years that if we put it all together on the right weekend, we can win a tournament, so that will be the goal for each tournament. You’ve managed to keep your core group of players pretty stable with a few new young recruits, how has that benefitted? “We’ve been lucky to have had the same group of core guys together for the for the last four going on five years now. It’s allowed us to have some continuity and build around those guys. Obviously, we also need newer younger guys coming in and adding to that core and bolstering that group and taking it to a new level. “We’re hopeful we’ve got some new guys coming through who can really add some quality and some newness, but at the same time we’ve got that experience of our core group who’ve finished 6th, 6th, 5th and 6th in the final standings. In terms of talent ID, how does the programme go about finding new additions? “There are a few different ways, the college system is the big one. You have marquee events such as the Penn Mutual CRC in Philadelphia which is a good opportunity for players to showcase themselves on the national stage. “Club 7s is also another opportunity, so there are tournaments like that over the summer. Are eyes still being cast on other sports for talent? I.E the likes of NFL/Athletics where Perry Baker and Carlin Isles originated from. “I think Carlin is probably the unique case because he had played a little bit of rugby before coming to the US team but really not much at all, whereas Perry had played quite a lot of club sevens before getting his shot in the national team. I think for the most part, the crossover athletes have tended to play some rugby domestically before they got their shot. “Rugby is the sort of sport where even if you run a 10 hundred flat as Carlin does, there’s a lot more that you need and Carlin has had to do a lot of that growing at the national team level which isn’t easy to do. I think for other guys, having that growth at Club and Collegiate level wherever it is could really help improve your game faster. I think it’s hard to do it when you’re expected to play and every result is critically important. How much has the team/programme progressed in the time that you’ve been part of it? “There are some things that are very similar and some things that have developed. I was there when Mike Friday came in (as head Coach in 2014) and he and his team changed a lot. “But I think it’s also in terms of growth, we were heading towards the first ever Rugby 7s at the Olympic Games and I think there were a lot of unknowns there. Then, as we got closer to that, things became a little more certain and everyone understood how the landscape would work a little bit more so I think that helped crystallise things. What was it like to be a part of the 2016 Olympics? And what did that do for the team and public perception? “The Olympics was an incredible experience. We didn’t do as well as we wanted or as well as I think we could’ve done and that was really disappointing. It was almost like ‘Wow I’ve been looking forward to this for years and in the blink of an eye, it’s gone’ and we didn’t get what we wanted. “As an experience though it was absolutely incredible, to be a part of team USA, marching in the opening ceremony and to be a part of an Olympic Games. “For the game in the US, I think it did change a lot. I remember after the Olympics I came back and was in a small town in Massachusetts, I had people saying to me “Oh yeah I watched the rugby, it’s the first time I’d ever seen rugby. How did that opportunity to tour with the 15s team and eventually gain 3 caps come about? “Before I got to the 7s team I was playing 15s at my College. I was on the Collegiate All-Americans. I played U20s XVs as well as 7s so I was always kind of progressing in 15s as well as 7s. “I think at different times, different coaches of the 15s and the 7s have had different outlooks on how the connection works and I think John Mitchell was very receptive and open to us, being where we were in the Olympic cycle it was something that the 7s programme was very open to as well. “I was lucky enough to go on that 15s tour, earning my way from coming on as a substitute in the non-cap game against the Maoris to then starting the other tests on that Fall Tour. “I loved my time being involved with the 15s, now we’re at a different point in the cycle where it’s back to the 7s and every tournament is a priority so it’s harder to get that time away. Just how far can the current 15s team go given the form they are in? The US Men’s 15s team recently reached their highest ever position (13) in the Rugby World Rankings and are currently on the longest ever streak of Test wins (9), a non-cap loss to the Maoris and a defeat to Ireland are their only blemishes in 2018. “We have some really top-quality players, the likes of Samu Manoa, Joe Taufete’e who’s at Worcester, AJ MacGinty who’s unfortunately injured right now but there are some really high-quality players in that US team. Has having players playing abroad and in an array of Rugby environments benefited the national team? The US 15s team has a mixture of players based abroad in the likes of England and France and then those who play their Rugby in the MLR in the US. Major League Rugby is a professional Rugby competition contested in the US and now Canada, which held its’ inaugural season in 2018 proving a great success on and off the field. 2019 will see 9 teams involved, with another 3 franchises set to join for the 2020 edition. “Yeah definitely and with the MLR even the guys who aren’t playing abroad are still playing professional rugby in the US and that makes such a big difference. “If you look back five and even maybe three years ago, they had part of the team who were amateurs working a job and then being expected to go out and compete against guys who are doing this full time for a living, playing in the best leagues in the world. The reality of that was that it was always going to be a tough ask. “So, having the MLR grow professional rugby in the US, but then also the number of guys getting solid minutes in the Premiership and the Championship and the leagues in France, has made such a big difference and I think you’ve seen that as the level of the 15s team has gone up and up in the last few years. As a League it’s constantly expanding with two teams joining this coming season and another three the next. Toronto Arrows and Rugby United New York will play in the coming season with the New England Free Jacks plus sides from Atlanta and DC the year after. “So, Toronto and New York have joined for 2019 with the other three in for 2020. New England are getting a team. As someone whose family are from the North East and with some friends who are involved, that’s been cool to follow along. Where can rugby get to in terms of popularity alongside the major US sports? NBC had its’ first free to air Premiership game when Harlequins took on Saracens in October, an NBC Gold membership now gives access to a huge range of competitions both live and on demand. TV audiences are on a huge rise for the likes of the Premiership and Six Nations. “I think it’s about finding a good complement to those sports. The NFL, NBA, even the MLB, have such a stranglehold on their markets, but finding a way to coexist with those sports is really crucial. "It’s maybe saying to young players you’ll play football in the autumn, but maybe in the winter or spring, you can play some rugby as well and that will help you with your tackling skills, your knowledge of how to move in space and complementary skills like that. I think it’s about emphasising those and finding a way to co-position rugby within the environment. “The number of guys who play high school American Football and go on to play college American Football is incredibly small, but then college football to the NFL is an even smaller percentage, so for these guys, if they’ve played some rugby at high school, they can always go on to try and pursue the NFL but then come back to it. Reports suggest that the US is a frontrunner to host the 2027 Rugby World Cup, what would that do for the sport there? “You do hear rumours of that but we’ll have to see what happens. The World Cup is definitely the cash cow for World Rugby so they’re not gonna take any risks with that because they know how valuable it is. “It will be interesting to see how it goes in Japan next year, somewhere that is perhaps labelled a Tier 2 Rugby Nation and if that succeeds then yeah maybe the 2027 World Cup could be here which would be really cool to see. On the subject of Rugby World Cups in America, how was it playing in the 2018 Rugby World Cup Sevens in San Francisco back in July? “It was so cool and absolutely incredible to be a part of, we were in the San Francisco Giants stadium which is an iconic Baseball stadium , there was a packed crowd who were so into the Rugby, again it was heart-breaking the way we went out, in extra time to England which is about as tough as it gets but as an environment and atmosphere we were so privileged to play in front of those fans, I wish we could’ve given them something more to cheer for but I consider myself very lucky to have played in such an incredible event. How frustrating was last season personally missing out on so much Rugby as well as that cup win? Prior to the Sevens World Cup, Madison missed a large chunk of the 17/18 Series with a knee injury sustained in the Sydney tournament back in January before returning for the London leg at the start of June. During his time on the sideline the US won their home tournament in Las Vegas, only the second ever Cup win in their history, after their maiden win of 2015’s London edition. “I got hurt very early into our first game in Sydney, played the rest of the game with a bad leg and then was held up pretty much the rest of the year. “It was tough. It was really my first major injury so it made for a different year in terms of really having to step back and be a part of it. Then when the guys won in Vegas it was so cool to watch that and they played so so well, but there’s a part of you that thinks ‘damn I wish I could be out there with those guys and playing’. Finally, what’s the plan for you from here and what goals do you have going forward? “I’m aiming for Tokyo in 2020 and then I’ll revaluate from there. We’ll see what happens after that, but right now, I’d love to be part of another Olympic Games and be part of another Team USA. “Over the next two years as a team, we really want to take that next step and go from a 5th-8th team in that chasing tier where we have the potential to win a tournament, to being a team that is one of the favourites every time they go out.